Tuesday, even Wednesday, has long been hailed as the best day to buy airline tickets. Finding cheap flights or figuring out when to buy airline tickets matters less these days if you have a travel credit card. The miles and points earned when spending on your travel credit card can pay for all, or a large portion of your airline-ticket cost. But before we go there, let’s look at what days of the week really are the cheapest days to fly, and how far out you should be booking your tickets to land those cheap airline flights. Is There REALLY a Cheapest Day to Fly? What About a Cheapest Day to Book Your Ticket? Absolutely! It’s a supply/demand thing! That leaves Tuesday and Wednesday, which, statistically, are the cheapest days to fly. Flying on Wednesday instead of Sunday (the most-expensive day to fly) can save you, on average, about $76 per ticket. Yes, traveling on Tuesday or Wednesday can be inconvenient. But just think creatively when planning a vacation. Instead of taking off Monday to Friday at work, take off Wednesday to Tuesday. It’s the same five days, but you get the benefit of cheap flights and you have an uninterrupted weekend at your destination, instead of two chopped up weekends that are spent recovering from the inbound flight and packing for the outbound return. If you believe the travel sleuths on the Internet, Tuesday is the best day to look for discount airline tickets. Airlines, the theory holds, typically announce deals on Monday evenings, and by Tuesday at noon, other airlines are trying to match those deals. So, Tuesday is, supposedly, the best time to buy airline tickets. Like I said: That’s the theory. Alas, theories don’t always hold up in practice. Sometimes you might get lucky and catch one of the major airlines testing a fare-price just after midnight, and sometimes that is on a Monday, but it’s really hit or miss. For its 2018 Annual Airfare Study, CheapAir.com looked at ticket prices across 6 booking zones – periods of times in which travelers typically book their tickets. Basically, what CheapAir’s research shows is that people who rush to buy a ticket four to six months out are overpaying. And those who book within about two weeks of their departure date end up paying through the nose. Instead, the savviest of travelers know the best time to book a flight is during what CheapAir.com calls the “Prime Booking Window”. This sweet spot typically lasts from 121 days before your departure date, to about three weeks out. So, that’s the time you really want to be looking for airline deals and locking in discount airline fares. 1) Begin pricing you flights about four months out. 2) Look to travel on the cheapest days to fly: Tuesday or Wednesday. 3) Watch those prices over the next several weeks … then pounce when you find a cheap airline price you’re happy with. Pretty much every season has its pricey moments and pricey destinations. 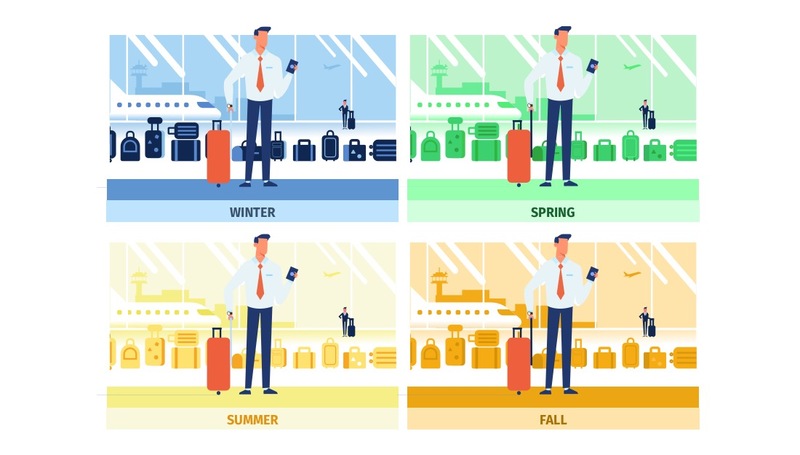 May through July tends to be the most-popular travel period for Americans (particularly those looking for cheap international flights) while Europeans pretty much take off the entire month of August. Winter has the obvious suspects – Christmas and New Year’s – that see airline tickets soar into the stratosphere. Fall has Thanksgiving in America, while Spring has Easter in much of the world. Nevertheless, lots of airlines the world over increasingly run fare specials tied to “special days.” Think “Black Friday Sales” that send American shoppers rampaging through malls on the day after Thanksgiving to grab steep discounts. Black Friday: The day after Thanksgiving in America, and a day that retailers in other parts of the world are increasingly glomming onto to hawk their products and services locally. Cyber Monday: The Monday after Thanksgiving. Boxing Day: December 26th in Canada, the U.K, Australia and elsewhere. Small business Saturday – Saturday after Thanksgiving. April 15: Tax day in America, on which airlines and retailers hope to goad taxpayers into spending their expected tax refunds on a vacation. Be on the lookout as well for seasonal specials! Airlines will begin running summer specials in early spring, especially offering cheap international flights, particularly to Europe. They pitch “spring-fling” getaways in the depths of winter, when days are gray and consumers are tired of polar vortexes and other winter chills. In the middle of summer they want you to think about a fall getaway, or even begin your planning for Christmas. The absolute best way to find out about these airline deals is to sign up for emails from the airlines you regularly fly, or the ones serving the destinations you’re interested in visiting. The moment cheap flights go on sale, you’ll know. Saving money on a cheap airline tickets is great, and finding that cheap international flight you want is wonderful. But getting an airline ticket for free: Way better! So, let’s wrap this up with a reminder that the best way to reduce your travel costs – the best way to travel cheaply – is by getting a travel-rewards credit card. The miles and points you rack up turn into free flights around the country … or around the world. And if you play the game right, you can often accumulate enough miles for an international flight just by signing up for a new credit card or two. The nut of all of this is simple: Do not wait until the last minute to book your flight, hoping through some miracle of accidental mispricing that you will be able to book that flight to Bali, for tomorrow, for just a couple hundred dollars. Knowing the best days to buy airline tickets and the cheapest days to fly increase the likelihood that you ding the airline deals and the cheap flights — even cheap international flights — that put a smile on your face and make your wallet equally happy. Follow the guidelines we’ve laid out above, and you will have the best chance at finding the discount airline tickets you want. But we are curious: What has your experience been with booking cheap airline tickets? Have you noticed, for instance, that particular days of the week are better for certain airlines? And have you altered your vacation schedule in order to book a better-priced ticket for a flight leaving on a day different than you originally wanted? Leave us a note in the comments section below.